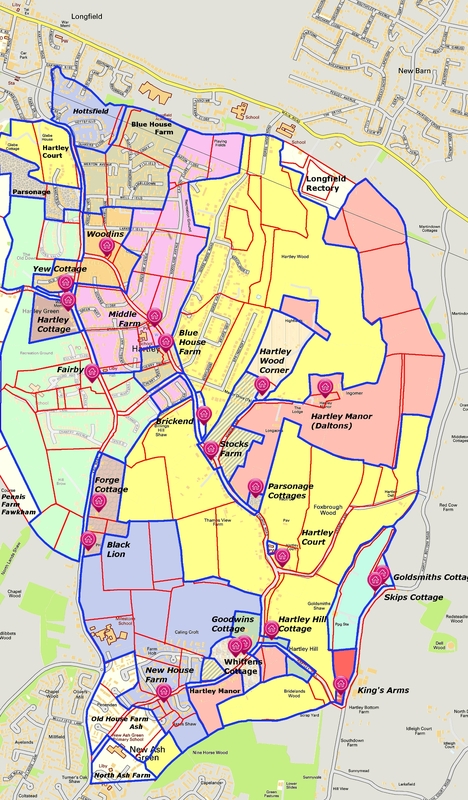 Under the bricks and tiles of modern Hartley lies a patchwork of ancient farms, most of which have existed in some form since the Middle Ages. The map below shows the ancient farms superimposed on the modern map, the red lines are the field boundaries in 1844. So, for example, the yellow land was once part of Hartley Court, the pink belonged to Middle Farm and the green belonged to Fairby Farm. Click on the farm name in the list below for more details.